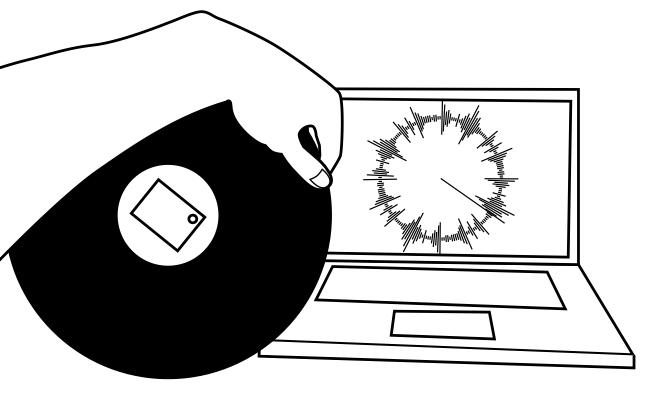 The AirRecord is a simple interface that allows the manipulation of mp3s using a record. The novelty of the project is that by using a wireless gyroscope sensor, the record is free from wires and other sensors, allowing the AirRecord to be freely used in the air. The AirRecord is calibrated so that it requires the same spinning speed as a standard 33 1/3 rpm record, allowing it to be used interchangably with real records on a standard turntable. The AirRecord started as a physical sketch whilst investigating uses for the SHAKE wirelesss sensor. After the initial exitement of using it to scratch records in mid-air, it also provided the starting point of my exploration into time in tangible user interfaces. Questions raised at this point included: ‘why are records so successful as a tangible medium?’, ‘how do users percieve time in a record?’, and ‘how can the desirable attributes of a record be included in standard tangible interfaces?’. An old (unwanted) 10″ record. This smaller size made it a little handleable mid-air. Custom hardware. The SHAKE device is good for prototyping, but is costly and has more functionality than is required. Designing a low-cost custom wireless sensor would be a good next step. Use of both sides. Easily achievable with the accelerometer built into the SHAKE. Selection of needle point. It would be great to be able to point at where the needle head should be, so you can adjust the position in the track.